CASE showcases a special CASE Rodeo event, displays its full offering of 360-degree solutions and exhibits machines designed to reflect the customer-centric, applications-based ethos of the brand. CASE Construction Equipment’s display – from its new location at stand FN 817 – focuses on heritage and innovation. Reflecting CASE’s approach to providing solutions for customers’ specific requirements, visitors will experience an application-based layout of the CASE stand at Bauma 2019. Quarrying, recycling, urban construction and road-building will each have a dedicated area, with CASE showcasing a total of 15 machines and sister brand IVECO displaying four vehicles. The CASE machines and IVECO vehicles will combine to provide a celebration of the CNH Industrial brand – past, present and future. In the quarrying section of the stand will be a CASE 1121G wheel loader, a CASE CX300D excavator and an IVECO Astra HD9 truck. These all possess the dexterity and power required to deal with the demands of the quarrying application. The CASE 1121G features a Stage IV FPT Industrial engine without diesel particulate filters (DPF), delivering best-in-class, high-torque performance at low rpm, without the need for an extra cooling system. Innovation continues inside, with a one-piece curved windshield and rear-view display delivering a breakthrough in operator comfort and visibility. An electronically controlled pump, larger main valve and multiple hydraulic sensors on the CASE CX300D result in up to 6% greater breakout force, making it ideally suited to the challenges of a quarry. Further enhancing the machine’s credentials in this area are its advanced sensors. These continuously monitor the nature of the work being carried out and then automatically respond with the required amount of hydraulic pressure. For recycling, there will be a CASE 821G Waste Handler (WH) wheel loader and an IVECO X-Way NP crane-tipper truck. The CASE 821G WH’s Stage V engine features FPT Industrial’s Hi-eSCR2 after treatment technology. As a result, it is maintenance-free, as well as being compact enough to still maintain excellent rear view visibility. Specifically engineered for the recycling industry, the CASE 821G WH also features a complete waste guarding pack that protects the machine and prevents material build up. This includes a front axle guard, lifting cylinder guards, front frame debris ejector belts and tank belly protection. Stationed in the urban construction sector will be the new CASE CX90D excavator, the CASE TV450 compact track loader, CASE CX18C and CX37C excavators, a CASE 570ST backhoe loader for non-regulated markets, a CASE 321F compact wheel loader and an IVECO DAILY 4×4. The CASE CX90D MSR completes CASE’s D series excavator range by adding a midi-sized option. This swing version has a Stage V Yanmar engine, with its 3.3 litre capacity producing 69HP. This results in increased torque at lowers rpms and an overall wider torque range. Fastest in its class, the CASE CX90D also features options such as oil sampling ports, quick coupler provision and LED lights. Benefitting from the latest advancements in operator comfort, this brand-new machine has the spacious CASE D SR series cabin, large and easy-to-read monitors and a high-back seat designed to reduce pressure points and therefore fatigue. The CASE TV450, the largest compact track loader ever produced by CASE, will be making its European debut after being launched in North America earlier this year. With a massive operating capacity of 2040kg at 50% tipping load, the CASE TV450 can comfortably handle demanding loader work, ranging from pallet moving to forestry. CASE’s Selective Catalytic Reduction (SCR) technology ensures this power is delivered efficiently and the engine remains easy to fill and maintain. Performance does not, however, come at the expense of operator comfort. The cab offers a spacious width of nearly one metre and is fully pressurised to reduce noise and keep out dust fumes. IVECO’s Daily 4×4 is the first 7-tonne Gross Vehicle Weight 4×4 vehicle with a payload up to 4,300kg in the market and a choice of body lengths up to 5m. Part of the new Daily 4×4 range, it offers IVECO’s class-exclusive Hi-Matic 8-speed automatic gearbox, as well as ABS-equipped disk brakes. The Electronic Stability Programme (ESP) has been specifically developed for the Daily range of trucks, guaranteeing top braking performance and durability. On show for road building will be the CASE 856C AWD grader, CASE1650M dozer and the IVECO X-Way tipper truck. 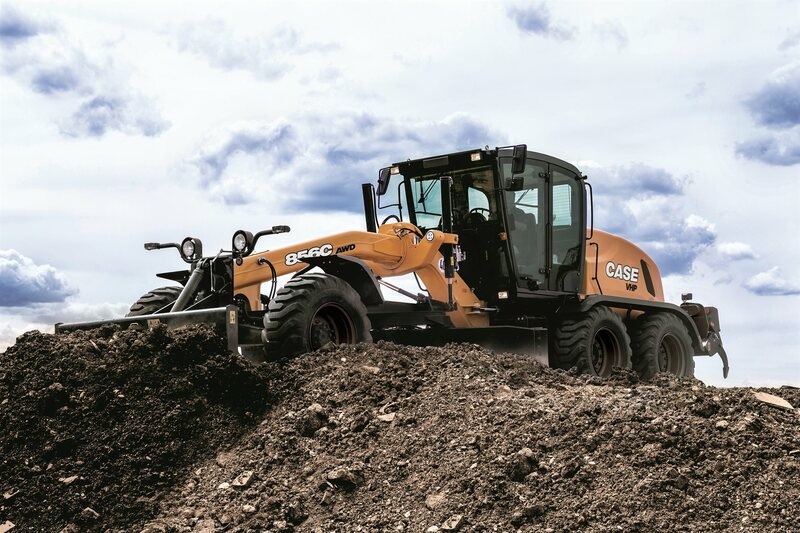 CASE’s C Series of graders feature best-in-class mouldboard control. Also, this latest range of CASE graders comes with an advanced Ergopower transmission combined with a torque converter, ensuring smooth shifting for perfect control. A roller-mounted, encapsulated slewing ring means effortless mouldboard rotation, providing a zero-friction engineering solution. These features combine to deliver the highest degree of accuracy in the industry. The CASE 1650M dozer is specifically engineered for high pushing power and grading precision. A turbocharged engine produces high torque, while the hydrostatic transmission means each track is powered independently. This means the CASE 16050M dozer can push at full power throughout a turn, resulting in total control for fine grading and slope work, as well as unbeatable productivity. These features also prevent the jumps that can arise from speed shifting, further enhancing fine grading accuracy. Alongside this, the CASE 1650M’s proportional electrohydraulic joystick offers outstanding comfort and confidence when controlling the dozer. Delivering the robustness required for road building applications, the IVECO X-Way tipper also features IVECO’s latest fuel efficiency and safety technologies. The result of this is high productivity, best-in-class payload and outstanding total cost of ownership. 2019 marks the 50th anniversary of the CASE skid steer loader. As a result, an original CASE 1530 Uniloader from 1969 will take pride of place on the stand. Since their inception, skid steer loaders have been fundamental to the CASE brand. The current line-up retains the same versatility that made its predecessors so popular, while combining cutting-edge touches, such as a cab offering market-leading visibility. All machines displayed on the CASE stand will be equipped with an array of certified attachments. In addition, three ‘islands’ near to each equipment application section will give further examples of how CASE’s attachment solutions can adapt to deal with nearly all customer needs. Celebrating its own anniversary, the CASE European Rodeo will be coming to Bauma 2019 with a specially-designed game for the CASE stand. Operators are invited to take part in this daily competition to show their skills and the manoeuvrability of the CASE CX145D excavator. A Rodeo winner will be announced daily, with a prize issued at 17:00 CET Monday through Saturday and at 15:00 CET on Sunday. Alongside the prizes for operator skill, there will be daily giveaways of Rodeo-themed merchandise. Several operator schemes will be unveiled at Bauma 2019 to celebrate the CASE operator family and reward them for their loyalty and commitment to the brand. These are all part of CASE’s mission to build a community around the people behind its machines. Finally, in a true reflection of one of its key themes for Bauma 2019, CASE is also set to debut many operator-focused advancements, including the reveal of the patented combined steering functionality on the CASE 856C AWD grader. This unique development provides the template for the next generation of CASE graders. Continuing the theme of enhanced operator experience, CASE will also unveil an electrohydraulic (EH) control system for its 321F compact wheel loader. The new hydraulic quick coupler will improve visibility, while a new frame for the forks increases the rollback angle, allowing for safer handling of loads. To complete CASE’s offering at Bauma, visitors will enjoy an interactive display of CASE’s 360-degree solutions. Members of the Parts and Services team, alongside those from CNH Industrial Capital, will be on hand to talk visitors through the complete business solutions CASE offers both dealers and customers, including bespoke financial packages, extended warranties, maintenance programmes and competitive cost of ownership. Visit CASE Construction Equipment and IVECO at the new stand location FN 817 on Monday 8 April at 12:00 CET to witness the unveiling of a history-making product innovation.